I'm working on an entry about my trip this weekend. Short version - it was AWESOME. Time with good friends, catching up with my cousin, amazing food, fun music... The weekend was just fantastic. Until I have that finished, though, I thought I'd give you a little look at the Danny of yesteryear. I thought of this story yesterday when I was going through airport security, musing on how different it is now than it was ten years ago. Here we are in 2010, taking off our shoes, and watching the lady in front of us being told that she'll be subjected to a thorough patdown if she doesn't remove her sweater. But I also remember going to visit a friend in NYC for New Years 1997-98. At the time, he couldn't get Shiner Bock up there, so I took a twelve pack of it as my carry-on luggage. Just to reiterate that, I decided to forgo having something to read on the plane, or bringing on my bag instead of checking it, just so I could carry beer on the plane. Can you even imagine how many TSA rules that would break now? I watched a supervisor get called over yesterday because a dude was carrying a half-empty bottle of V8. At least beer can be stowed under the seat in front of you and made inconspicuous. 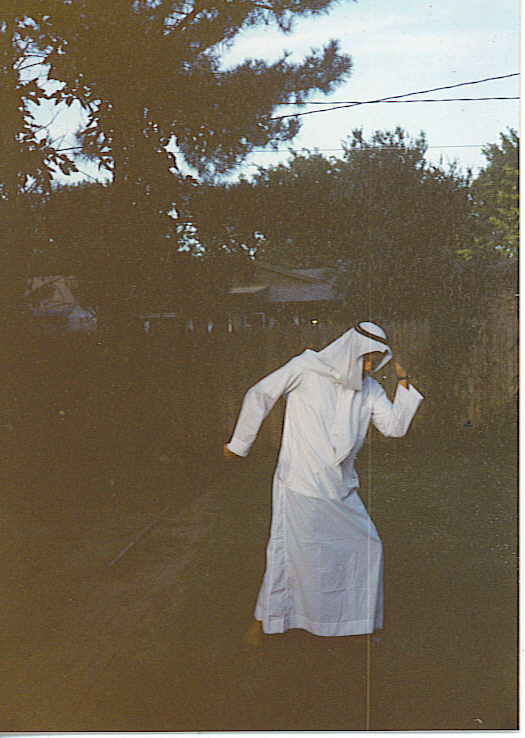 The summer after my junior year of high school, I had the chance to take part in a month-long study program in Kuwait and Oman. It was one of the best, most eye-opening experiences of my life. Here's a picture of me in my parents' backyard on the night that I returned. I didn't change into that outfit once I got home. No, for it to get the laugh that I wanted when they saw me, it had to be on when I left the plane. My itinerary was JFK to Washington National, then to DFW, and lastly back to Lubbock. There wouldn't be much time to connect in DFW, so I put the outfit on in a bathroom in Washington. Our nation's capital has a pretty diverse crowd traveling through it, so I didn't get too many second looks. Reactions were much more uncomfortable once I got back to Texas, but you know what's important to me? Committing to the bit, that's what. So I found myself thinking of that in the security line yesterday, wondering how much I'd still commit to that bit now, almost 15 years later. Is wearing a dishdasha worth a full pat down? The little voice inside says that my answer would probably be yes. My parents once took a feast into an airport too meet long distance friends who had a long layover in our town. Wine, shrimp platters, the works! Can't do that now. Love the outfit. You would certainly get some interesting reactions now, wouldn't you? Wow, that's pretty amazing! 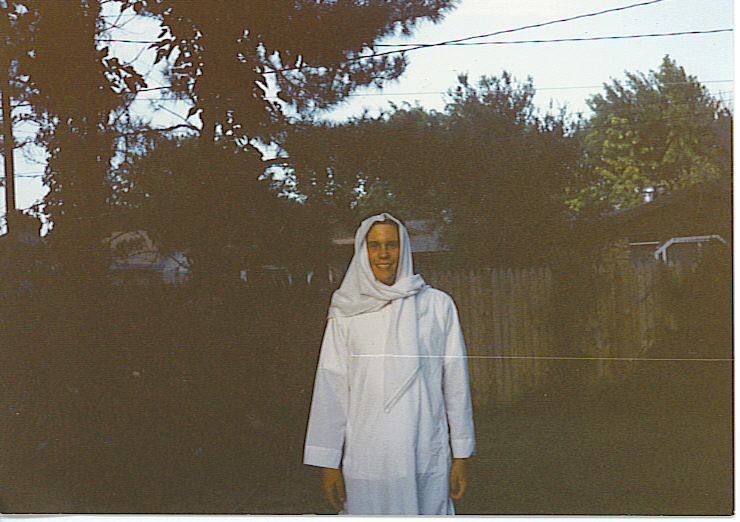 I didn't know that you had gone to the Middle East in high school - what an incredible experience!! And that IS commitment to the bit, and a good bit at that! To see your parents' - who, I now remember, were able to see you as you disembarked the plane at the gate - reaction must have been priceless. A combination of, "Our boy's HOME!" and "Wow, he hasn't changed a bit! :)" Pure joy. Things have certainly changed. That being said, I flew on 6 different flights (a pair of which were two and from New York, in fact) carrying a scalpel, I was later shocked to discover. Actually, after I posted this, I thought of the NPR reporter who just lost his job last week for saying that he doesn't like to fly with people who are dressed like this! I'm kind of gobsmacked that they didn't catch that scalpel. Certainly I get why a guy in your line of work may be carrying one, but that's a piece of equipment with a pretty unique silhouette. I'm wondering how they didn't pick that out! oh HELL yes. it would be SO worth it - for you. not me. but, you? YES.